I sat in a taxi in Sydney last year, on my way to indulge in another large helping of steamed dumplings in my quest to try all of the top 8 dumpling restaurants Sydney has to offer (as voted by website Concrete Playground). The taxi driver was a middle aged gentleman of Greek origin. I asked him about his opinion of Uber. Did he hate them? Had business slowed since their inclusion into the market? etc. He told me to open his glove box. To my surprise, within the glovebox was his Uber identification tag. He had a foot in each camp! He had accepted that Uber was here to stay and slumping in his seat and complaining about it wasn’t going to get his bills paid. To cut a long story short the main learning I took away from this interaction is that we can choose to take one of two options. Embrace the trends or fight the trends. An example of an educator who is not embracing trends (used with permission from Mr Jones online from Teachers pay teachers). Some examples of students who have used Snapchat filters to record their responses. (used with permission from the students). Many sportsmen and sportswomen are setting up 'athlete' Facebook pages. Even people who have only been going to the gym for a week or two are setting up fitness based Instagram and Facebook pages too. 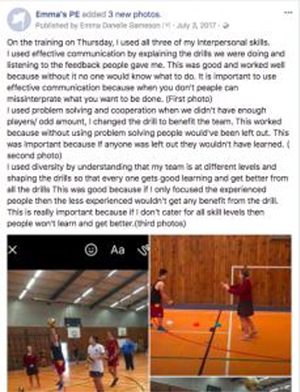 An example of a post from a students’ “athlete” page. It is a reflection of their use of interpersonal skills throughout a lesson. Matt Lambert will be presenting at flipCon, visit www.flipconaus.com for the details.